Hearthstone Aurora Eclipse | Patio and Hearth Co. The new Eclipse freestanding gas fireplace combines Hase’s design mentality with the gas technology of the Aurora collection. A simple modern design frames the clean, linear Aurora gas fire. It is a perfect combination of fire and furniture. See more details about the Eclipse here. Comfortable Modern, A flickering fire can add just the right touch to any living space. The Eclipse gas stove present a simple linear fire in clean, minimal designs that will compliment a modern aesthetic. Enjoy the warmth and ambiance of a burning fire that makes modern feel cozy. 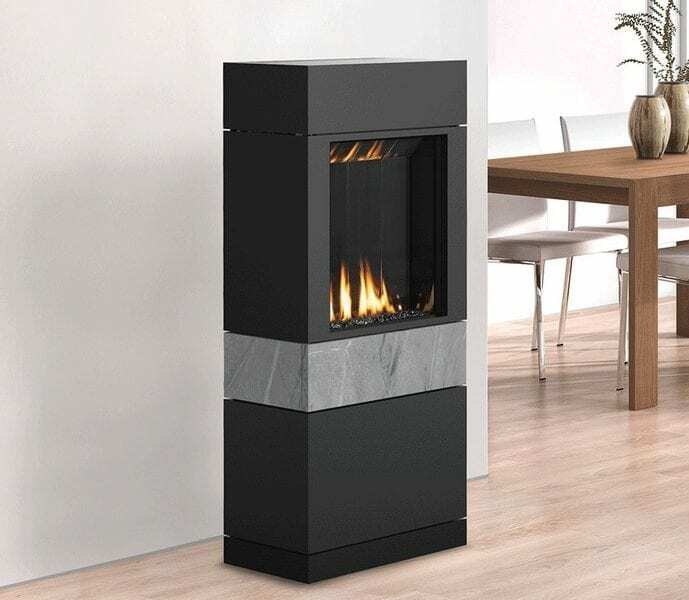 • Reflective black enamel interior magnifies the glow and depth of the fire. • On-demand ignition system conserves energy in warm weather, provides reliability in cold weather. The Eclipse gas stove is currently available as Direct Vent or Vent Free. The accent is crafted from real soapstone. Inquire about Hearthstone Aurora Eclipse using the form below.